In my recent discussion of the masks in Donald Cordry’s book, Mexican Masks, I noted that there is a strong tradition of mask making in the Mexican state of Guerrero and that this state had also been an important source of decorative masks. I called your attention to some of Cordry’s photographs of traditional Guerrero carvers. In my discussion of the decorative masks, I shared some of Cordry’s thoughts about devil or Diablo masks. Unfortunately, most of Cordry’s Diablo masks from Guerrero fell into the decorative category, providing little exposure to the truly impressive traditional devil masks from this state. Today’s post will begin to correct this imbalance. In Guerrero there are various isolated style areas. This variety is reflected in the Diablo masks from this state. I will present a cluster of similar masks in this post and other designs will follow, next week. Today’s post will display Diablo masks with horns that drop down from the forehead to frame the face. The first of these is a near duplicate of a mask in one of Cordry’s photos of carvers with their masks. In fact that was the reason that I bought this mask on EBay™. In Plate 145 (page 103), Cordy introduced us to Ruperto Abrahán, the son of Nalberto Abrahán, whom he had interviewed in 1972. Both carvers lived and worked in Tixtla, Guerrero and so I will refer to these Diablo masks as representative of the Tixtla style. The Tixtla style Diablo mask in Cordry’s photo is located just next to Ruperto’s right hand. Here are photos of my similar mask from EBay that I bought in April of 2014. 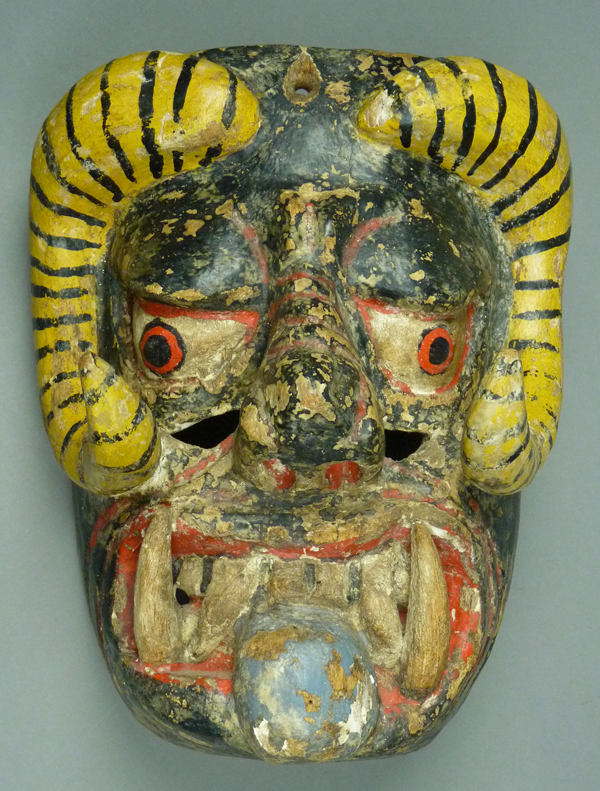 It was accompanied by an old tag: “6 Fantasy Devil Mask, ‘Dance of the Devils,’ Cualac, Guerrero. Approx. 60 years old. $1200.00.” Cualac is about 100 miles away from Tixtla. Apparently it had been purchased for a high price in the past, and now it came back on the market for a much lower price. I actually paid $270 for this mask, with shipping. I want to begin by saying that because this mask so closely resembles the one in the Cordry photo, it is likely to date from that time (circa 1972) and it was probably carved by Ruperto. Therefore it is no more 40 years old at present. However it was claimed to be 60 years old in the past, perhaps in the 1980s. As you will see, the back of this mask has not been falsely aged. I wish that I could say the same thing about the face of this mask, but I cannot. I regard the sort of paint loss that you will see on the front and side views as possibly due to deliberate mechanical abrasion, and unlikely abrasion at that. I believe that this mask was sold in the heyday of the decorative masks and that it was falsely presented at that time. Nevertheless I find this mask interesting as an example of the Diablo masks that were made by an important family of carvers, and representative of a style of Diablo mask that was traditionally used in the region of Tixtla. In other words, I view this as a traditional mask that was later falsely aged. It would have looked magnificent with its original paint. 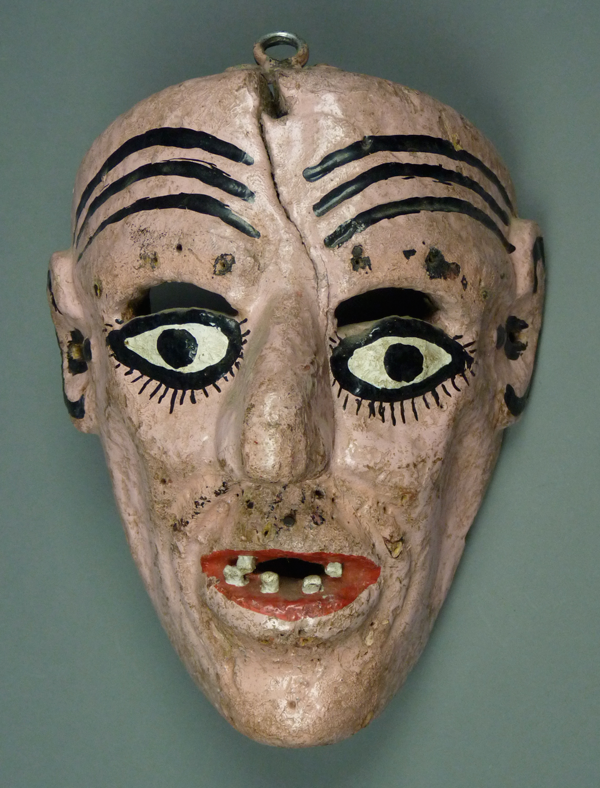 This mask is the largest of today’s group, at 10½ inches tall, 8 inches wide, and 5½ inches in depth. As a Mexican mask collector, I have always felt drawn to groups of masks, such as those from a particular village, those by one carver, or those from a particular dance. Such groups permit one to see patterns and differences. 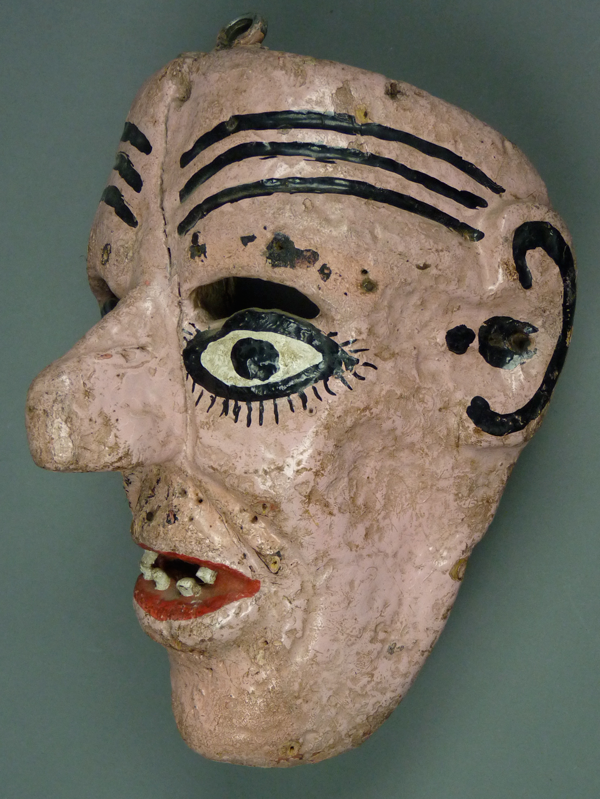 When I first read Mexican Masks (by Donald Cordry), I became interested in masks from the Mexican state of Guerrero. Of course many of the decorative masks came from Guerrero, but I decided to focus on the many authentic masks that also came from that state. The Guerrero carvers had a long tradition of masks that were deliberately over-sized for dramatic effect, a quality that I found interesting. I also found it interesting that there were masks of females in traditional Mexican dances. Writing about the dances in Michoacán, Janet Brody Esser (1978, volume 1, pages 10 and 71) provided an enlightening perspective on the characters in Mexican dances. Briefly, almost all masks in Michoacán (and throughout Mexico, as I have come to discover by exploring her ideas) fall squarely into one or the other of two contrasting groups—”the beautiful and the ugly.” By beautiful Esser is referring to noble or idealized figures, such as saints, while ugly is associated with imperfection, ignorance, irreverence, malice, and associated personality flaws. In such a system, there are no ordinary people, only caricatures that represent extremes. Therefore it should come as no surprise that most of the female masks found in Mexican dances represent either an idealized figure or saint, such as the Virgin Mary, or a negative character, such as a degraded woman, a clown, or a diabla (female devil). Today I am going to present a small selection of female masks from Guerrero; I wish I had more. The female face of this mask has been deliberately carved to be unattractive. 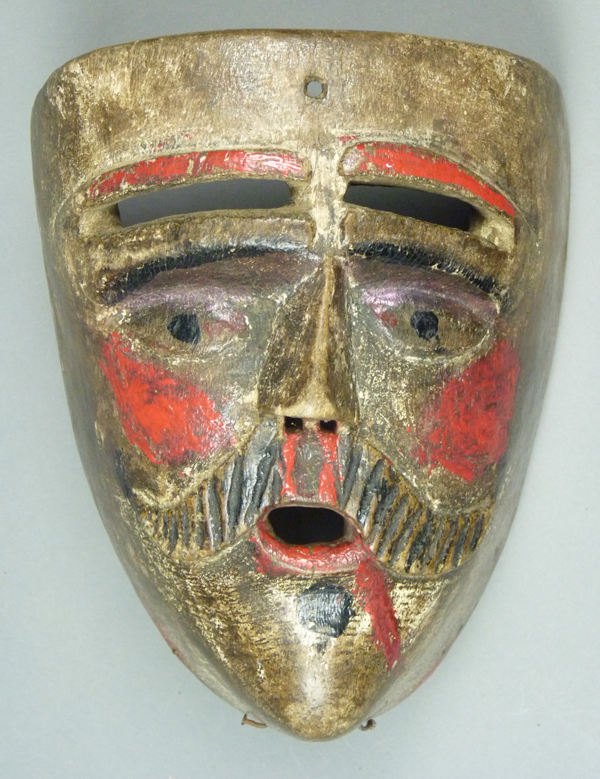 The height of this mask is 7½ inches, the width is 6 inches, and the depth is 4½ inches. For example she has a long nose and prominent teeth. This mask is old and heavily worn. note the repairs—a tin plate and the hardware on top that bridges a split in the wood. This week I am showing another mask that I recently found on EBay™. Like the mask in my opening post, this was another that had a very familiar face. Although I do not know the name of this carver, I do know his hand. That is, I have repeatedly seen masks with this collection of design details, and two of those masks are in the Catálogo (catalogue) of the Moya Rubio Collection, one with a goatee that is identified as a Santiaguero from La Danza de los Santiagueros (Plate 259, page 80), and another that is said to be a Moor from La Danza de los Moros y Cristianos (Plate 262, page 81); the latter closely resembles the EBay mask. Both were said to be from San Pablito Pahuatlán, Puebla. In passing, note that these masks are from a different part of the Mexican state of Puebla than the masks in my book. The EBay Moor was in some ways different from the mask in my initial post. On the positive side, I was surprised to discover that it was a little smaller than the other masks like this that I had seen. I believe that it is a mask that was made for a child to wear in the dance. On the other hand, the face of this mask turned out to be very darkly stained, causing one to wonder why. One possibility is that the mask was converted from one role to another; maybe the Moor characters are depicted with dark complexions, while the Christians have white faces, or perhaps it was to be used in Carnaval. It is clear that this mask originally had a white face, although most of that paint seems to have worn off. 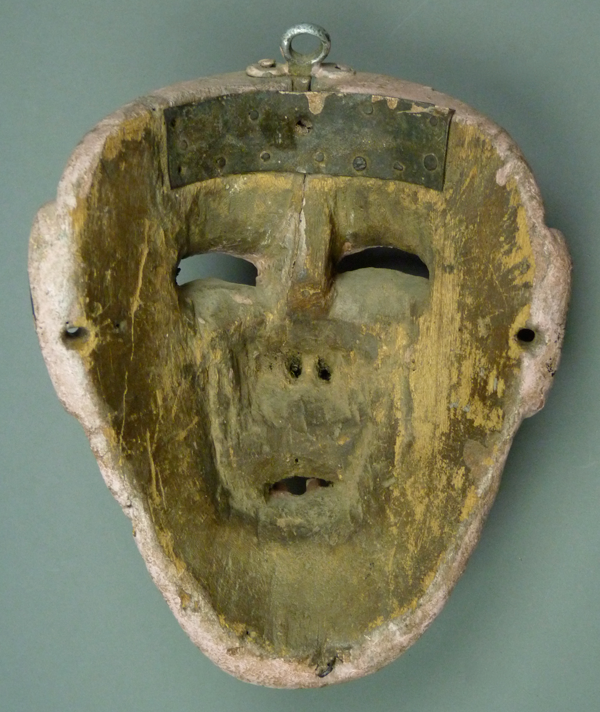 Another possibility is that this mask was deliberately stained, in order to create the impression of greater age. Yet a third possibility is that the mask suffered great neglect, so that exposure to damp conditions might have caused this discoloration, but it lacks a musty odor that would reinforce this idea. Such questions do arise when one is adventurous in the acquisition of Mexican Dance Masks. 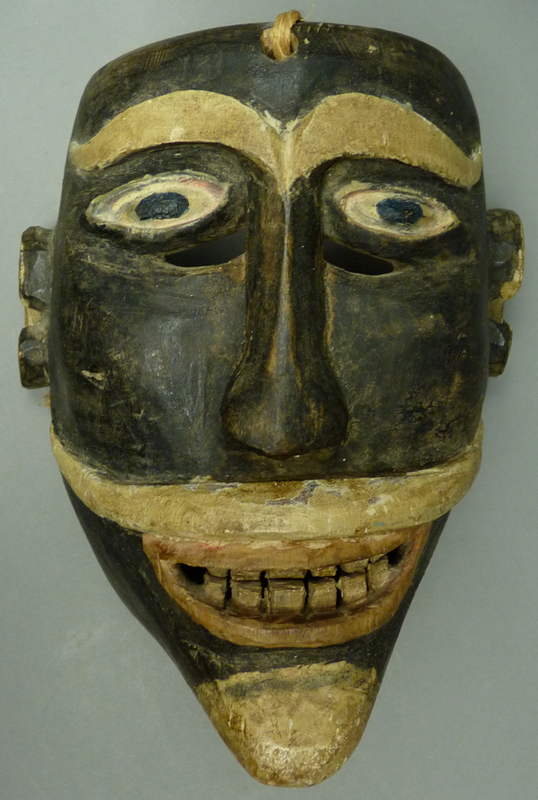 I would say that this particular mask is not for the beginning collector, nor for the timid, but it does provide a springboard for us to talk about this anonymous carver. Now I will show some photos of the EBay child’s mask of a Moor. In this view, one can see hints of the original white paint on the face. There are nails on the chin that would have held some sort of hide or hair for a beard. In my last post I discussed a set of five masks from Santa María Peñoles, Oaxaca, that were used in the Dance of the Dead. I contrasted this dance to another, the dance of the Matarachín, which will be the subject of today’s discussion. I will begin with a brief overview. As noted in my last post, Todos Santos/the Day of the Dead occurs each year on November first, although there is local variability regarding the days that specific spirit visitors might be expected, such as infants and children on one day and adults on another. Dances and celebrations related to Christmas follow in December. For example the Totonacs celebrate el Niño Perdido (the finding of the lost Christ child) each year on the evening of December seventh, there are specific Totonac dances about the birth of Christ later in the same month, la danza de Lakapíjkuyu and la danza de Lakakgolo, and all of Mexico entertains the singers of Las Posadas from December sixteenth through December twenty-fourth. La danza de Matarachín is said to begin on Todos Santos and then to unfold more elaborately on the octava, on the eighth day of November. This second part goes on for three days and ends with the unmasked dancers visiting the cemetery, where their steps trace the shape of a cross. Only at the very end of this phase does the Matarachín dancer appear and perform. In passing, I have observed this dance practice of the dancer making the sign of the cross with his feet in another setting. Obviously this is something that was introduced by the Christian missionaries. It is my impression that this signing occurs when devoutly Christian dancers are impersonating evil dance characters; the dancers reaffirm to God their true beliefs, using their feet. Such reaffirmation may seem necessary because the masked personages who dance in this performance pretend to represent the malignant dead. Such characters can appear in Mexican dances at All Souls or during Carnaval (or Mardi Gras); apparently their original purpose was to propitiate or otherwise fend off any genuine evil spirits that might have thought it necessary to visit. However the major character, El Matarachín, is unique to this localized dance, which occurs in the area of Veracruz around Papantla, in such towns as El Espinal and Paso de Valencia. As you will later see, the published descriptions of this dance refer to the perspective of duality or dualism as a likely key to understanding its meaning. These words can refer to opposing concepts such as good versus evil or to a fundamental belief within a polytheistic religious system that the fate of the universe is determined by conflict between several gods (or groups of gods), who are engaged in an eternal struggle for dominance. In contrast Christianity rejects such a view, insisting that God is the one and only ultimate power. I discovered the relevance of these concepts during the writing of my book about the masks and dances of the Sierra de Puebla. Despite the appearance that the Indians of the Sierra de Puebla had accepted Christianity, overtly converting from polytheism to monotheism, the available evidence suggested the opposite possibility during some interim period. How else could one explain the Miguelitos dance in which Christ and Satan are presented as equals sparring for power, when Christian doctrine portrays God and Christ as omnipotent and Satan as powerless. For their relationship to have been so dramatically adjusted, these personages must have been somehow redefined by the dualistic perspective found within the traditional indigenous religious system of that region. What was that system? The traditional Indian gods of Mexico had multiple aspects and each aspect could have a different name, creating the appearance of a cluster or team of gods. This is analogous to the Christian concept of the tripartite God—Father, Son, and Holy Spirit, but with an important difference. While the three Christian manifestations of God (the trilogy) are considered to be in perfect alignment, the multiple aspects of the Indian gods often demonstrated a variety of goals and styles and each of these aspects (or personalities) might have unstable or conflicted behaviors. Thus dualism does not only refer to conflict between gods but also to conflict within a particular manifestation of a god. The two great Aztec gods of the Sierra de Puebla were Quetzalcóatl and Tezcatlipoca and they were indeed perceived as frequently in conflict about the control of the universe, although occasionally they were said to work together to accomplish some great task. Based on the perception of similarity or of shared features, the Indians appear to have identified Christ as yet another manifestation of Quetzalcóatl. Thus Guy Stresser- Péan, a distinguished French anthropologist (2009, e.g. 515), described a group of linked Totonac deities that included the sun, el Niño (an alter ego of Quetzalcóatl), and Christ. The Europeans did the same thing in reverse, by immediately announcing that Tezcatlipoca was really Satan. This comparison and connecting of Indian deities with Christian deities and related figures probably occurred soon after the European missionaries arrived and initiated conversion. Exploring this aspect, I found suggestive evidence that Tezcatlipoca had also been provided with some new connections through this process. Traditionally this god had more than twenty manifestations, but he seems to have picked up a few more that reflect European personages, namely Pilatos (based on Pontius Pilate), and Satan. Both Pilatos and Satan appear as characters in the Matarachín dance. It is said that one can recognize Pilatos by either his remarkable smile or his alarming angry frown. Here is a mask of the smiling Pilatos. He was collected in Paso de Valencia (a town where the Matarachín dance has been documented to occur) in about 1970, and with a history of use during the season of Todos Santos, so this is Pilatos from the danza de Matarachín. This is a wonderful mask. Shari Cavin (Cavin-Morris Gallery) sold this to me from her personal collection in 1995. Note the carefully carved ears. This week I will shift to another subject—The Day of the Dead—inspired by a recent purchase on EBay. The seller, an online auction service, offered a set of five masks. These were obviously old and worn in appearance. Furthermore, they demonstrated numerous pinholes on their surfaces, as if they had been infested with wood boring insects, or they had been carved from wood that had been previously infested. Such masks can be very fragile, but these seemed to have normal strength, without obvious broken areas, except for a split out section on one of the ears of the Chivo, and a small broken area on the chin of the Calavera. By now you may be wondering why anyone would buy such damaged goods. In fact, I had at least two reasons. To begin with, the carving of these masks was of very high quality, and there were several interesting designs. Masks of monkeys are very uncommon in the Mixtec towns, so their presence was of major importance, the skull mask was a masterpiece, the Viejo mask was superb, and the goat mask was also well carved. Therefore I was willing to gamble that they were not as fragile as they looked. Furthermore, each of the five masks had a small paper tag, in barely legible Spanish, that explained its role in “La Danza de los Muertos” (The Dance of the Dead). These tags were yellow with age. The information on the tags had evidently been copied from older labels that were pasted on the backs of each mask, but all that remained of the original labels were small corner fragments. No writing had survived on those scraps. It seemed possible to reconstruct the dance by translating and then combining the five descriptions from the tags, which seemed a remarkable opportunity to rescue an obviously old tradition from oblivion (salvage anthropology). The consigner had also provided the seller with limited further information. The masks had been collected in a small town in the Mixteca Alta of Oaxaca—Santa María Peñoles—in the 1930s or 1940s, and the last owner had purchased them from the original collector, in Mexico, in the late 70s. There had been additional masks in the group, with human faces. For many centuries, the Mixtec Indians inhabited their own region in the present Mexican state of Oaxaca. The Mixteca, the territory of the Mixtecs, extends from the Costa Chica (little coast) of Oaxaca to the highland plateau of that state. It is customary to speak of the Mixteca as a region divided into two parts—the alta (highland) and the baja (lowland), which lies along the Pacific coast. Santa María Peñoles is a highland town that lies to the west of the city of Oaxaca. Note that the correct pronunciation of Oaxaca is contrary to what many expect. One says “Wah-há-ka,” where each “a” has the same sound as that letter in “watch.” Think of Baja, California, as another model. Here is an overview of the “Day of the Dead” celebration in Mexico. This appears to be a complicated story that has many unknown details, but there are some obvious starting points. 1. Prior to contact with Europeans, the Indians of Mexico already believed in an afterlife, and perceived death as a passage from one phase of life to another. They had burial rites, and they viewed the souls of the dead as potentially dangerous to the living, necessitating special funeral practices and precautions. 3. When the Spanish brought Christian missionaries to Mexico to convert the Indians, these two traditions were immediately blended, such that the European tradition was adopted, but yet indigenous elements crept in to alter its practice. This is an example of something that anthropologists call “syncretism,” in which a conqueror imposes a new religion, but elements of the native religion are somehow retained, usually covertly or in a disguised form. 4. In Mexico the terms “All Souls” and “All Saints” have merged into one, so that many Mexicans believe that the souls of most of the dead return each year to visit their living relatives for 24 hours on November first. This is an occasion of great joy for the living as they savor the belief that they are momentarily reunited with lost relatives. But then there are many local versions regarding the specific days when certain of the dead can be expected to visit. For example, those who were murdered or who died violent deaths may be expected on some other day or they may be perceived as unable to visit at this time of year. The souls of young children are often greeted during the 24 hours after November first. 5. In fact, All Souls is one of two times in the year when the souls of the dead may visit; the other occasion is at the time of Carnaval, the holiday that North Americans call “Mardi Gras” or “Shrove Tuesday.” There are regions in Mexico where there is apparently concern about possible visitations by the malevolent (or “unquiet”) dead, prompting the development of dances and related activities that are meant to mimic and thereby counteract such risks, and these can occur in November or during Carnaval. There were similar European traditions that have been reduced to our familiar Halloween activities. With this background in place, we are ready to investigate the evidence for a very specific dance tradition from Santa María Peñoles, in the state of Oaxaca. I will present photographs of the five masks, including with each mask views of both sides of its paper label and my transcription of this. Then I will share my translation of the five labels. This will permit us to reconstruct this local version of the Dance of the Dead. Here are the five masks ordered according to their numbered tags. Mask #1—a large mask with a monkey’s face, the “Nahual Major.” Nahual (or Nagual, in Spanish g and h are often silent letters), which can mean sorcerer, is absent from many dictionaries, but Donald Cordy discussed this word and concept at length in Mexican Masks (e.g. page 174). He stated that nagual means “guardian spirit” and usually refers to an animal spirit that is part of a person’s soul. He also said that many Mexicans still believe in the concept that each person can have his or her own nagual, although now the word tonal is frequently substituted for nagual. Cordry believed that the Indians of Mexico had masks of naguales (plural form) and that the Spanish relabeled these as the masks of diablos. Major (pronounced “má-yor”) is an adjective that means lead, head, or chief. 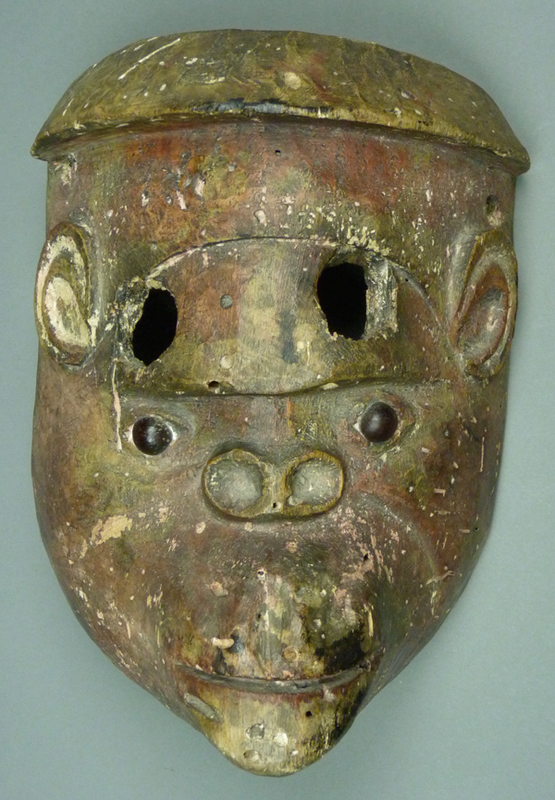 The Chango Major mask seen from the front. The vision slits almost seem like an afterthought. It measures 9″ x 6½” x 4″.